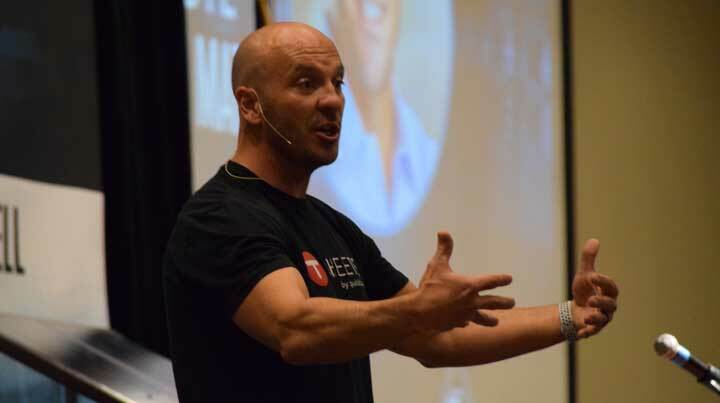 Grand Junction – Colorado Mesa University’s 2019 Entrepreneurship Day event featured keynote speaker and CMU alumnus Matt Rissell, the co-founder of TSheets. Rissell is a national business leader featured in Forbes, Huffington Post and other national publications. Rissell serves on the executive committee of the Idaho Technology Council and is the recipient of numerous national awards and commendations. Rissell’s founding of TSheets in 2006 marked his sixth successful startup venture, making him one of CMU’s most visible alumni. Rissell is known for simple and instructive advice that he has issued through national commentary. His message is one that resonates with many students when it comes to business, ideas and entrepreneurship. Rissell’s address to students and area businesses occurred on April 2 in the Meyer Ballroom at CMU. Rissell also spoke at the Montrose campus the following day. The 14th annual Entrepreneurship Day event is a fundraiser for scholarships at CMU that brings visibility to the university's growing entrepreneurial endeavors. Campus leaders are excited about E Day and believe 2019 is perhaps the most anticipated year in the history of the event. Liz Meyer, President and CEO of the CMU Foundation believes Rissell’s keynote address is contributing to the excitement. The 2019 event sponsors include Bray Commercial, Baird, Home Loan Insurance, ProSpace, Shaw Construction, U.S. Bank, Venture Advocates, Central Distributing, Bank of Colorado, The Commerce Trust Company, Enstrom, Shear, Inc., Alpine Bank, The Daily Sentinel, FCI Constructors and ANB Bank. Robert Bray, CEO of Bray Real Estate believes in CMU’s role as an incubator of ideas and training ground for future business innovators. “There is immeasurable value in a future workforce that comes equipped with creative thinking and dynamic business skills,” said Bray. “These characteristics are reinforced during E Day, and the strong programming is why there is such broad support from local businesses for this annual event,” said Bray. While Rissell is an event highlight, the keynote address was just one agenda item of an entire day-long itinerary of entrepreneurial celebration and business training. During the lunch program, CMU student entrepreneurs pitched their ideas, with interactive audience participation, as attendees voted for the best business plan. Georgann Jouflas, MBA, is a CMU Instructor of Business and coordinates student involvement during E Day, including the elevator pitch. First place went to Aaron Frick with Frick-in Tune, second place went to Brandon VandenBosch, Rikki Cook and Sam Seirs for Catio and third went to Austin Rickstrew and Danielle Fleig with HELP Personal Assistant. Preceding the E day lunch, a series of educational breakout sessions occurred around campus for ongoing training and business education.